Equinox p2 now produces a small SWT-based installer that can be used to install the Eclipse SDK. This article gives details on how to use the installer. 1 Why should I use the installer? 2 How do I use the installer? 3 How do I configure the installer? Why should I use the installer? NOTE: The installer does not seem to be downloadable using the instructions on this page. Apparently it is not regularly maintained right now and the builds for it have been disabled. Older versions and the current source code of the installer are available, and the director application exposes roughly the same capabilities, though at the command line rather than through a GUI. The installer leverages p2's inherent support for multi-threading, pack200 compression, dynamic mirror balancing, and certificate validation to address these problems. How do I use the installer? Get the installer for your platform from the equinox download page. The installer zips are listed under the Provisioning section, once you select your version. 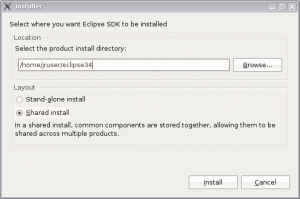 If doing a Stand-alone install, you can delete the installer directory (/opt/eclipse) when done, as your target directory (~/eclipse) will contain a full Eclipse install. If doing a Shared install, all the shared Eclipse SDK plugins will be stored in a default directory, e.g. (C:\Documents and Settings\Administrator\.p2) on Windows XP. How do I configure the installer? The installer uses the Java system property org.eclipse.equinox.p2.installDescription to fetch the URL of the installer properties file. By default this is set to an installer website. Then modify installer.properties with the properties you want. In particular you will probably want to change the eclipse.p2.bundleLocation and the update site you use. Here the site is set to eclipse 3.6, the bundle pool folder is "bundle-pool" and the directory where eclipse.exe gets installed is "eclipse-win32"
You can use an installer.properties file to fetch plugins into the p2.touchpoint.eclipse folder, but you cannot then install those plugins unless they contain a Product (that is, they include a eclipse executable). The following will work to download the EMF SDK plugins, but will NOT work to install an EMF-enabled Eclipse install, as the sdk.feature.group does not include the Eclipse SDK itself. The version of the root installable unit to install. If this property is omitted, the installer will select the newest available IU that matches the rootId property. A boolean property specifying if the installed application should be launched immediately after install. A human readable name of the product being installed. This value is used when referring to the product in the installer dialog. This page was last modified 15:36, 8 May 2013 by Timothy Woods. Based on work by Hendy Irawan and Andrew Niefer, Eclipsepedia user Consiliencenow.gmail.com and others.